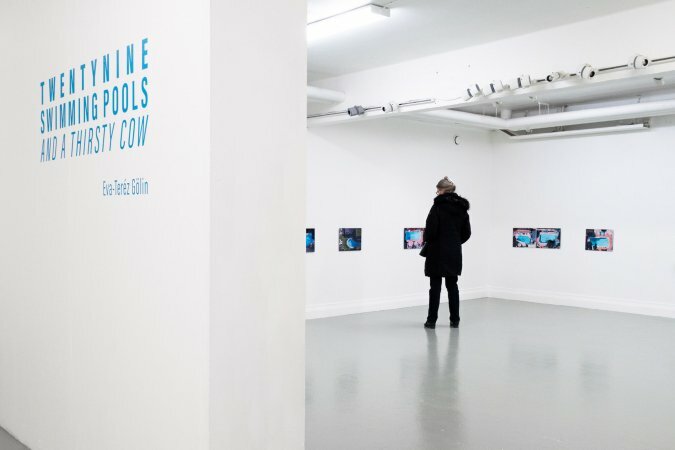 Twentynine Swimming Pools and a Thirsty Cow at Galleri Rotor in Gothenburg, 2019. With the advent of Hollywood movies in the 1950’s the swimming pool became a suburban status symbol; an unmistakable sign of prosperity, success, and freedom. 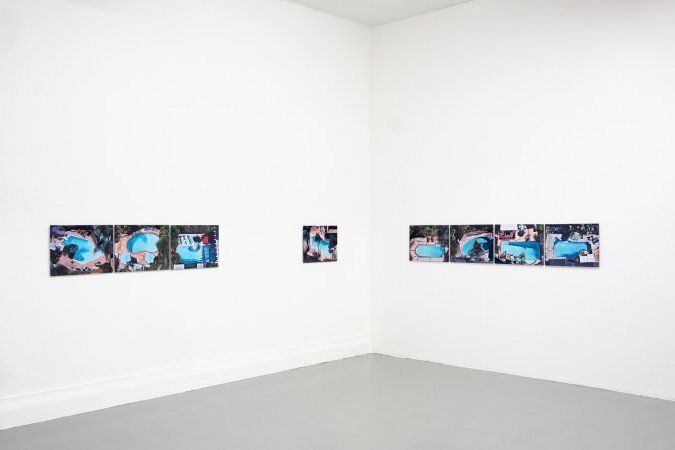 The venue and context have changed, but swimming pools remain a signifier of luxury, leisure, and glamour. 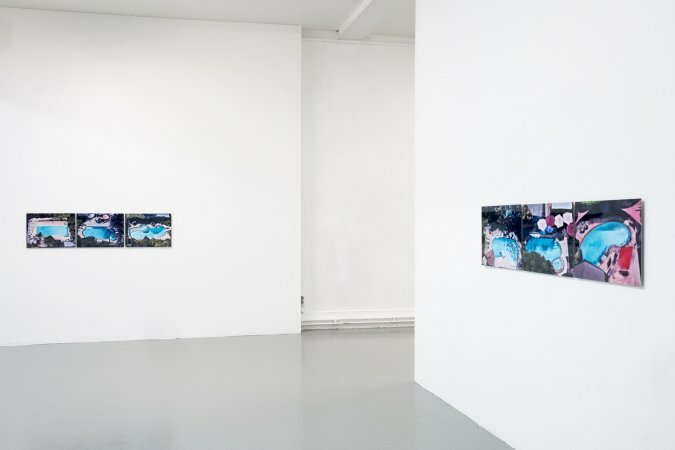 In this exhibition, Eva-Teréz Gölin lets the viewer peek over rooftops and hedges, in like manner as she has utilised the surveilling eye of Google to capture these images of a seemingly deserted neighbourhood. 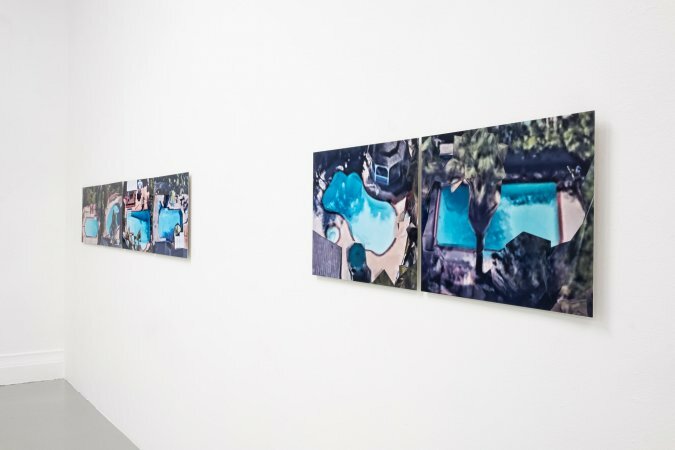 Although back yard swimming pools are often hidden from prying neighbours’ eyes by fences or dense hedgerows, Google’s bird’s-eye view of the suburb renders the turquoise surfaces clearly visible as symbols of material success. 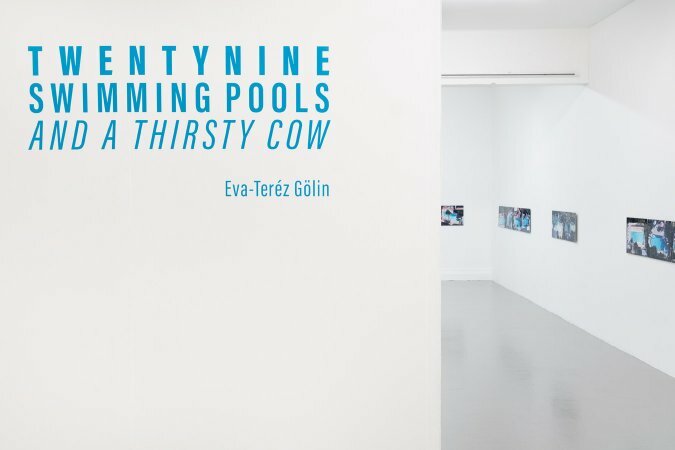 The work, Twentynine Swimming Pools and a Thirsty Cow, is based on American artist Ed Ruscha’s conceptual photo book, Nine Swimming Pools and a Broken Glass from 1968. 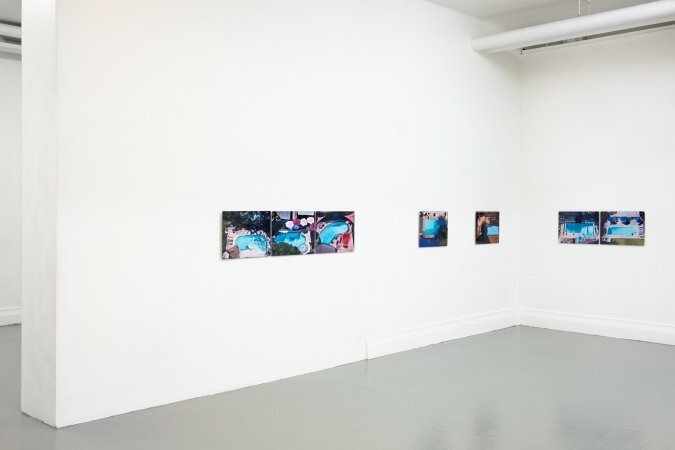 Numerous artists’ books from artists such as Elisabeth Tonnard and Jonathen Monk have since originated from this as well as other of Ruscha’s books documenting the Los Angeles landscape, e.g. Twentysix Gasoline Stations and Some Los Angeles Apartments. 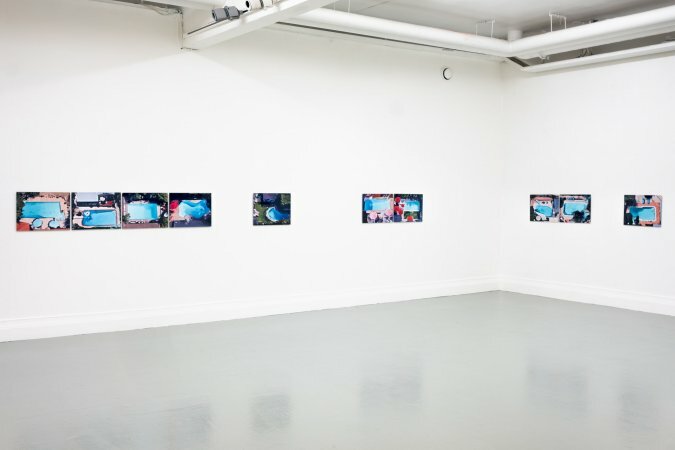 As in Ruscha’s work, Gölin’s version suggests a narrative; the balance between the ‘good life’ and its price tag. A narrative wherein water consumption plays an important role as we deal with droughts and forest fires which are increasing in numbers. The addition of “a thirsty cow” interrupts the sequence and gives the reader pause and opportunity to contemplate water usage on different levels. 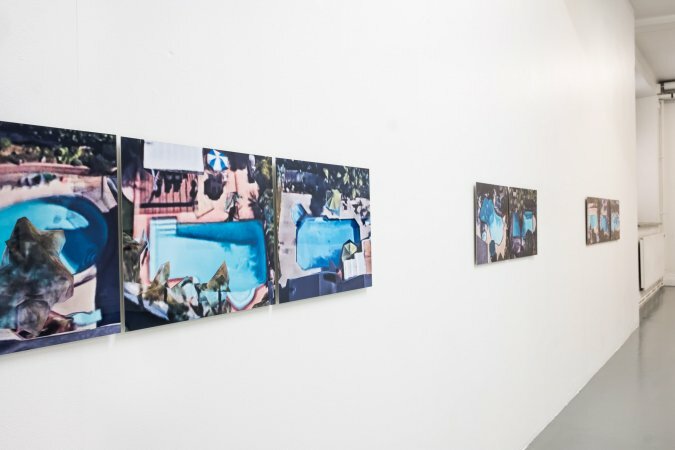 The images are sublimated onto aluminium with a high gloss surface, enhancing and reflecting the water surfaces of the sun-drenched swimming pools. The sublimation process is a cutting-edge way to reproduce an image where the colours are transferred and permanently infused into the scratch resistant surface of the aluminium plate by heat and pressure.